When you are dairy-free, you miss Afredo Sauce, right? This Vegan Alfredo Sauce is inspired! Vegan Alfredo Sauce over Spaghetti Squash. Tasty! Hi. It’s Lois in the kitchen with Recipe Idea Shop. 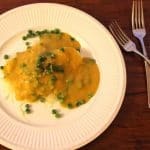 It’s National Meat Out Month, so I am reposting this recipe for Vegan Alfredo Sauce over Roasted Spaghetti Squash. It’s one of my most brilliant ideas. I used my Gingery Buttercup Squash Soup as the sauce over Roasted Spaghetti Squash, added some tiny peas, and called it a meal. I also garnished the sauce with a little candied ginger and fresh, chopped mint. And it was SO good. I started with the roasted spaghetti squash. 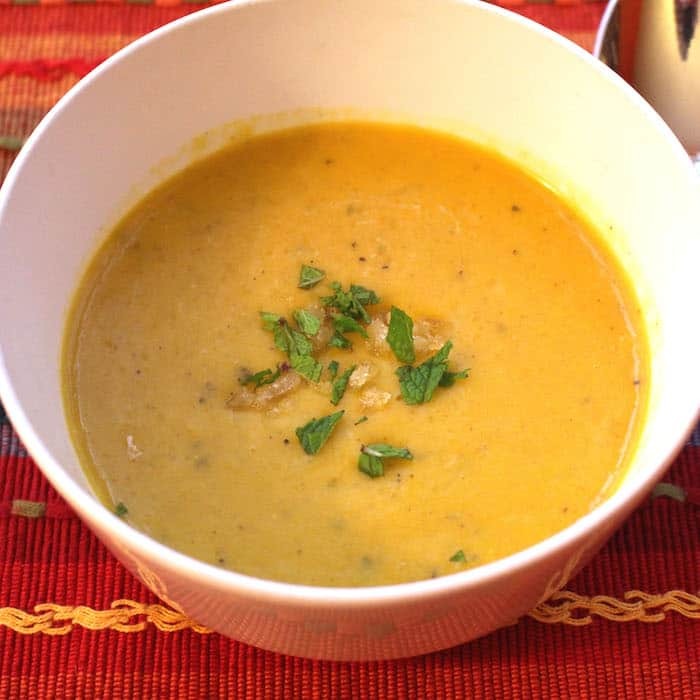 Then I added the Gingery Buttercup Squash Soup, which is a thick, creamy, delicious soup. It makes a wonderful vegan (and gluten free) substitute for cheesy alfredo sauce. (Of course, the two dishes taste nothing alike, but I can’t eat cheese so I was happy to find this substitute.) I loved it! 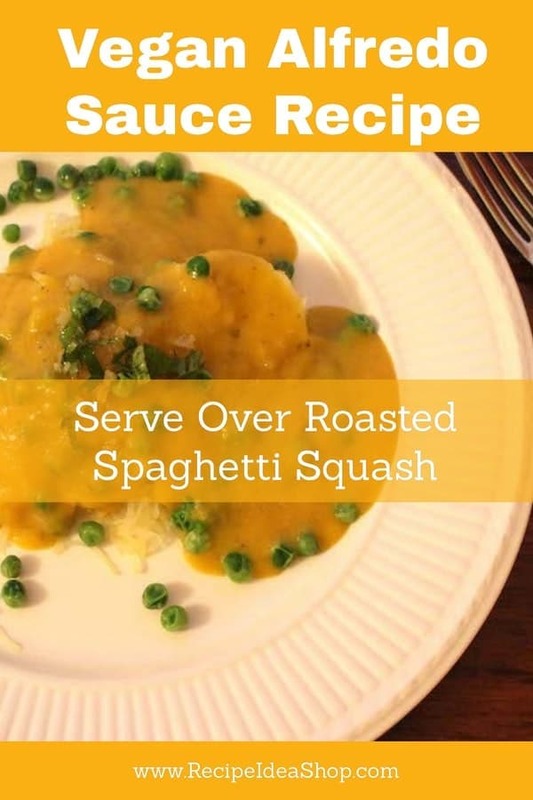 See How to Make Spaghetti Squash and Gingery Buttercup Squash Soup for the individual recipes. Add about 1 cup of steamed peas, a little candied ginger and chopped mint to each serving. Crystallized Candied Ginger Chunks-Unsulfured, 1 pound. Buy it on Amazon. Creamy, dairy-free, gluten free "alfredo" sauce made with squash. 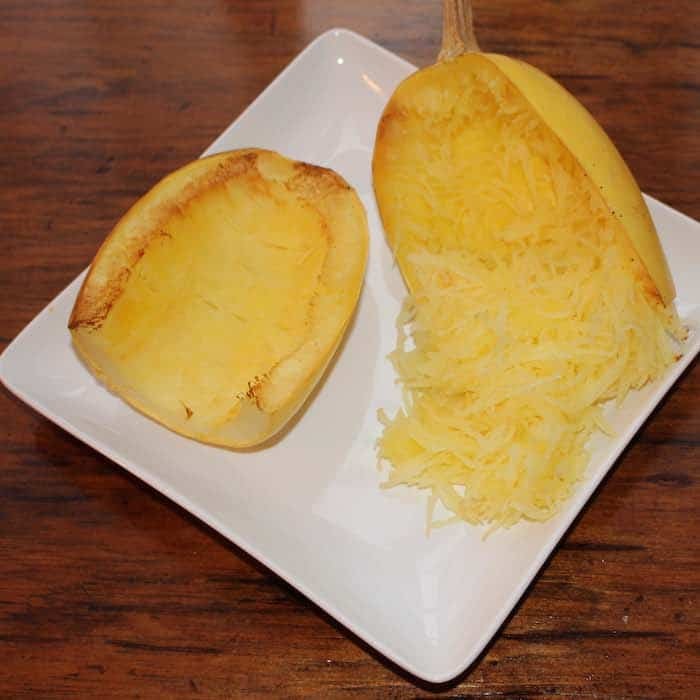 Roast the Spaghetti Squash and, when done, use a fork to shred the squash to look like noodles. Add the peas to the Gingery Buttercup Soup and warm over medium heat or in the microwave for 3-5 minutes until hot. Ladle the soup over the squash and garnish with a few pieces of fresh mint and a bit of candied ginger, cut in small pieces. 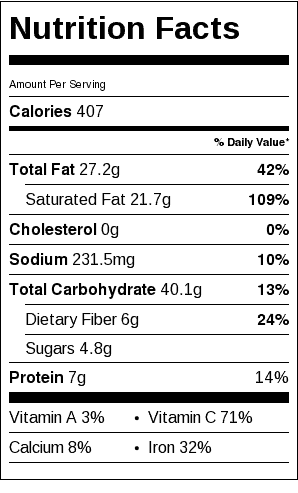 Spaghetti Squash with Vegan Alfredo Sauce Nutrition Label. Each serving is about 1/6 spaghetti squash, 1 cup Gingery Buttercup Soup, and 1/3 cup peas.